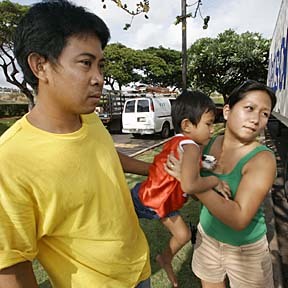 Sonia Tabladillo takes her 4-year-old-son, Kyle James, from her husband, Gerry, after they were reunited with Kyle and their other son, Andrew, almost 2, next to the Goodyear store at the Kapolei Shopping Center. Earlier, someone stole her van with her two sons inside. The state has collected nearly $15 million more in deposits on recyclable beverage containers than it has paid out to consumers under the new recycling law. China's Zhang Yimou hopes his future films allow him to present more than a kung-fu view of his native land. The Warriors depart on their fourth road trip of the season today for their Western Athletic Conference matchup at San Jose State on Saturday. Grace Pacific Corp.'s plan to terminate the lease of the operator of Molokai's main quarry has caused concern the move could stall building on the island. Governor Lingle is encouraging local faith-based groups to apply for federal assistance, but it should not blur the line between church and state.